23 OctNimish Biloria and Jia-Rey Chang @ XV OSSA architectural workshop "Fata Morgana"
20 SepAlireza Hakak lectures at eCAADe'11 on "New perception of virtual environments, Enhancement of creativity"
06 SepNew PhD Candidate Jia-Rey Chang explores the development of "SmartGeometry"
Hyperbody's lecture series is proud to host Bert Bongers on Wednesday, January 12th at 16:00 at protoSPACE, room D, Faculty of Architecture, with an introduction by Prof. Kas Oosterhuis. Traces is a lecture about how to inform design processes by "reading the environment", observing and finding traces of use, echos of past expressions and imprints of behaviours. It is a design research method which can serve as an input for (re-)designing our environment. The City as Canvas is a video-projection response and at the same time extension of the Traces. Electronic ecologies are about distributed interactions between people and technological environments from the intimate, personal scale to the shared, social and architectural scales. 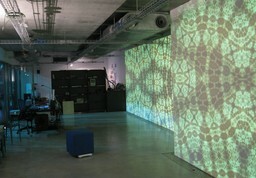 The ideas are illustrated by recent projects, such as real time video-graffiti, sonification of skid marks, and unintentional 'builder graffity' that reveals the hidden layers of the urban electronic ecologies, interactivated lace textiles and video projections, wireless sensing techniques distributed interactions for real-time urban information. Dr. Bert Bongers is an Associate Professor at the Faculty of Design, Architecture and Builiding at the Univeristy of Technology, Sydney, where he leads the Interactivation Studio as a laboratory with a flexible infrastructure to support many activities in design and research in interactivating objects and spaces.. He has a mixed background in technology (BSc EE), human sciences (MSc Erg. UCL London), and the arts, developed through education as well as practice. In his PhD thesis (VU Amsterdam) he combined insights and experiences gained from musical instrument design, interactive architecture, video performances, and interface development for multimedia systems to establish frameworks and an ecological approach to the design for the interaction between people and technology. He has set up new media labs in Amsterdam, Barcelona and Maastricht, lectured in workshops and newly developed courses on interaction at various universities and schools. He has taught in Masters programmes such as Industrial Design department (Technical University Eindhoven), Cognitive Systems and Interactive Media (Audiovisual Institute, at the Universitat Pompeu-Fabra in Barcelona) and regularly at the Hyperbody MSc. (prof. Kas Oosterhuis, Architecture department TU Delft, and User-System Interaction post-master TU Eindhoven. His audiovisual installations and performances have been presented at the Powerhouse Museum, DAB Lab gallery and Smart Light Sydney, Metronom Gallery and the Mercat de les Flores In Barcelona, and STEIM and other venues in Amsterdam. In 2011 he will start a new Masters programme on Interactivation at UTS. The Interactivation Studio is a research space at the faculty of Design, Architecture and Building at UTS, directed by Associate Professor Bert Bongers. It is a flexible reconfigurable lab space and infrastructure, facilitating multiple scenarios of use (teaching, researching, performing, playing, workshop). The research and design focuses on the interaction between people and technological environment, developing new interface prototypes and demonstrating new ways of interacting with computer environments. Such environments, or electronic ecologies (the idea of an e-cology emphasises the two way nature of interactions), can exist from the intimate scale (musical instruments, wearable interfaces, personal area networks, handheld networked devices), on the desktop, to the spatial scale of rooms and buildings (interactive architectures). The research approach of the Interactivation Studio is deliberately hands-on, mixing practical experiments with theoretical frameworks, developing in an iterative way in order to include everyone.